Whether I’m riding alone or in a group, I don’t hesitate to move over for faster or impatient drivers. And I don’t hesitate to lead the pack at a comfortable pace for me and my fellow riders. It’s all a matter of remaining within my comfort and capability zone to lead, follow or get out of the way. While out for a leisurely ride along New York’s scenic Taconic Parkway, I exited onto Peekskill Hollow Road in rural Putnam County. At the end of the exit, about a dozen drivers in high-performance cars – Porsche, Lotus, Corvette, Ferrari, Lamborghini – were lined up for a Sunday morning rip along a nice collection of twisty two-lane roads. I rode past these beautiful cars where they were parked and began enjoying my ride through this wooded, hilly area. I’d traveled less than a mile when a yellow Ferrari appeared in my rearview mirror, and the other speedy drivers followed. The Ferrari driver hadn’t pulled too close, but I knew he was outpacing me. I was maneuvering through the turns at a pretty good clip, but it made no sense for me to try to lead this crew. They wanted to travel much faster than I was going. And I didn’t feel like having them behind me. So, at the first opportunity, I pulled aside and waved them past. They blasted by and disappeared among the turns ahead. I made a similar move during my first ride on the road best known to motorcycle riders as the Dragon. This twisting, turning, undulating hunk of U.S. 129 crests Deals Gap at the Tennessee/North Carolina border. Riders come from all over the United States to experience the Dragon’s 318 turns in 11 miles. Shortly after I began my early-morning run on this popular road, I saw a rider on a red Ducati in my rearview mirror. He was negotiating the turns much faster than I. As he drew closer, I pressed harder to put on speed and stay in front. Two thoughts dominated my mind: don’t have an accident and don’t be a motorcyclist version of the guy who holds up traffic by creeping along in the fast lane. What if this guy just traveled 3,000 miles to experience Deals Gap? I didn’t want to ruin my ride or his. So, at the first opportunity, I squeezed over and waved him past. He blew by and I never saw him again. Recently I took a spot in the middle of a group touring a piece of the Ozarks in Arkansas. I was very comfortable following a few other riders as we moved at a good pace along country roads. A few years ago, I linked up with a group of friends in Sussex County, New Jersey, when they were traveling from Florida to Canada. They’d asked me put together a nice ride through New Jersey, New York and New England to the Canadian border. I mapped out then led the group along a 500-mile route on rambling back roads through scenic terrain and small towns. I set a comfortable pace that worked for me and the group, and I was happy to lead the pack. If I’m riding alone, in a group with other riders or on the road with other vehicles, it’s important for me to set my own pace…to ride within my capabilities. I decide when it’s best to lead, follow or get out of the way. It helps to keep me safe and focused. The entire line of Dynaplug tire repair tools give you a quick and reliable solution to plugging punctures in your motorcycle's tubeless tires. They're compact, easy to use and work great in emergencies. And what flat tire isn't an emergency? They're all made in the USA. 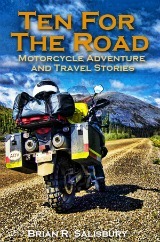 I recently launched a three-book series containing motorcycle travel and adventure stories and observations drawn from my jaunts throughout the United States and Canada. 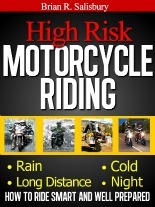 I've taken all the information in my website describing riding techniques for dangerous situations and added to it in the book "High Risk Motorcycle Riding." Media, bloggers, marketers, editors, publishers, web masters…do you need great content on your website or blog? 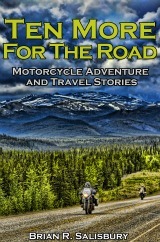 You can syndicate and/or republish any of this and other issues of the Savvy Motorcyclist E-zine for free. 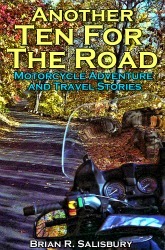 "This information appears courtesy of Brian R. Salisbury's Savvy Motorcyclist E-zine."